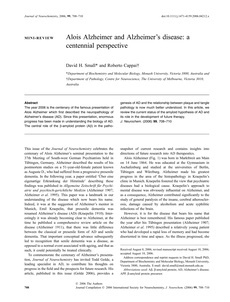 The year 2006 is the centenary of the famous presentation of Alois Alzheimer which first described the neuropathology of Alzheimer's disease (AD). Since this presentation, enormous progress has been made in understanding the biology of AD. The central role of the â-amyloid protein (Aâ) in the pathogenesis of AD and the relationship between plaque and tangle pathology is now much better understood. In this article, we review the current status of the amyloid hypothesis of AD and its role in the development of future therapy.